We are into the last day of work before returning to Guam. The first set of BRUVs is being recovered as I write. We will have time for one more set (8) and then we’ll secure the equipment and head for home (home for me anyway―everyone else will still be far from home). Steve is getting great data on the fish populations on the west side of Saipan. As much as we like watching the fish, we got more excited to see a turtle checking the bait, a moray eel chewing on the bait bag, and yesterday, a large tiger shark cruising back and forth nudging the bait bag. Unfortunately, the video ended while the shark was still at the BRUV. When we brought it up, the bait bag was gone. 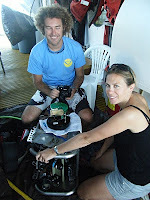 John and Viv deploy the TOAD each night and make 3 or 4 passes over the reef to assess coral coverage and other bottom features. 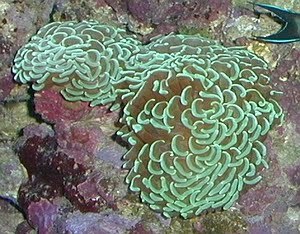 They were particularly happy to have found several areas of reef with the coral Euphyllia paraancora. This coral is found in the tropical Western Pacific and the Indian Ocean, but it is not common. It is heavily harvested for the aquarium trade and more susceptible to bleaching than more robust coral species. 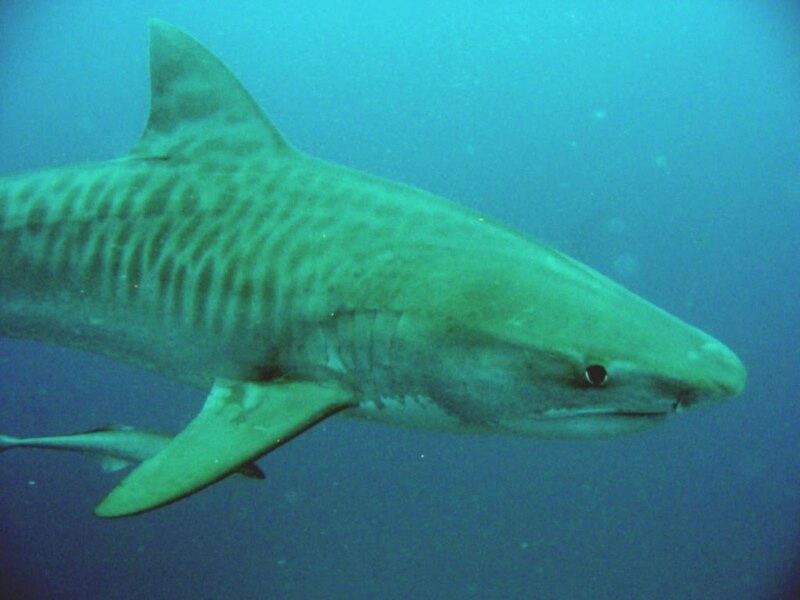 It is listed as vulnerable and is further threatened by the predicted threats of climate change and ocean acidification. It was put on the IUCN Red List and is protected via CITES, both as of October, 2009. 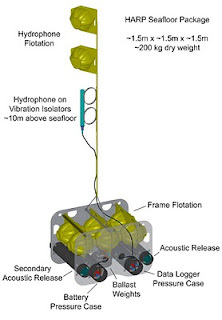 One night we deployed a HARP, a High-Frequency Acoustic Recording Package used to study cetaceans (whales and dolphins). The scientist in charge of this equipment was not onboard but had arranged with the Chief Scientist to put out this equipment near Saipan. This HARP will sit on the seafloor for 2 years collecting sounds. HARPs record ambient ocean noise including low-frequency baleen whale calls, high-frequency dolphin clicks, sounds in between and man-made sounds from ships, sonar, and seismic exploration. When the HARP is retrieved, the sounds can be analyzed and we will learn more about the cetacean populations of the Mariana Islands. 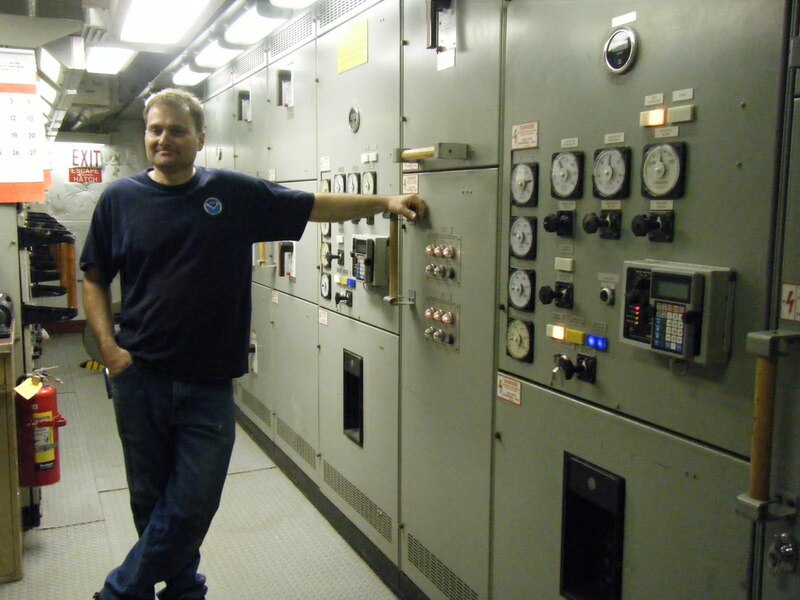 A few days ago, Glen gave me a great tour of the engine room. It is beyond the scope of this blog to describe it here, but I can’t resist including a few pictures. I am always amazed by what it takes to keep a ship like this running. 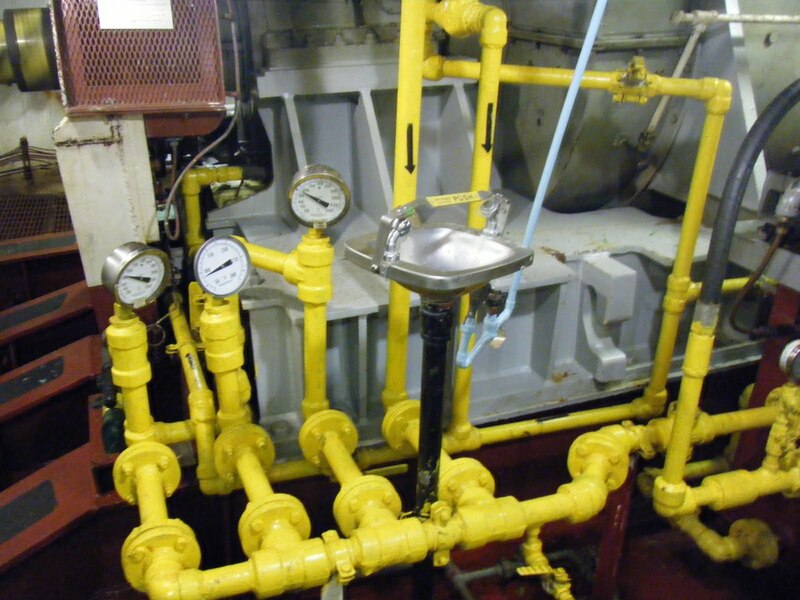 They call it an “unmanned engine room” because an alarm will ring if something needs attention like overheating or low oil pressure. It may be called “unmanned” but it takes a lot of man-hours to keep it that way. 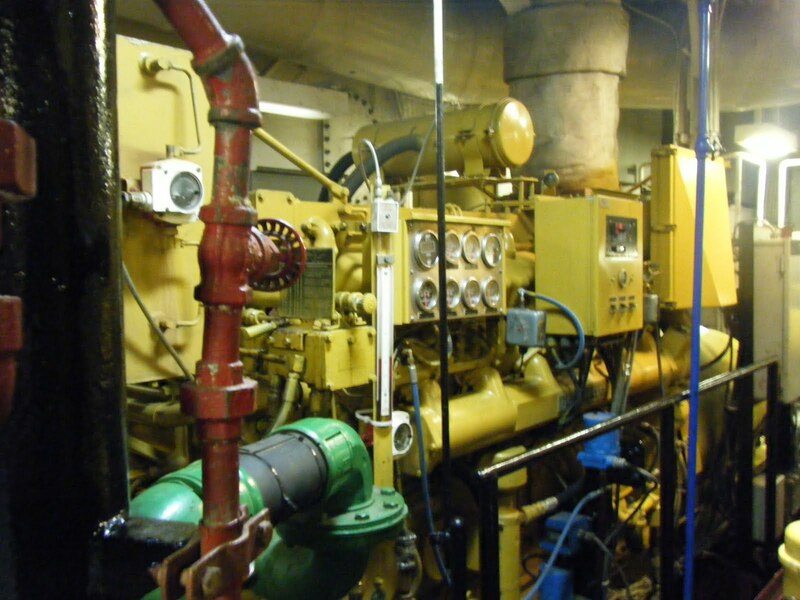 The engine room and machine shop are really clean and well organized―I didn’t see a drip of oil or a smudge of grease. 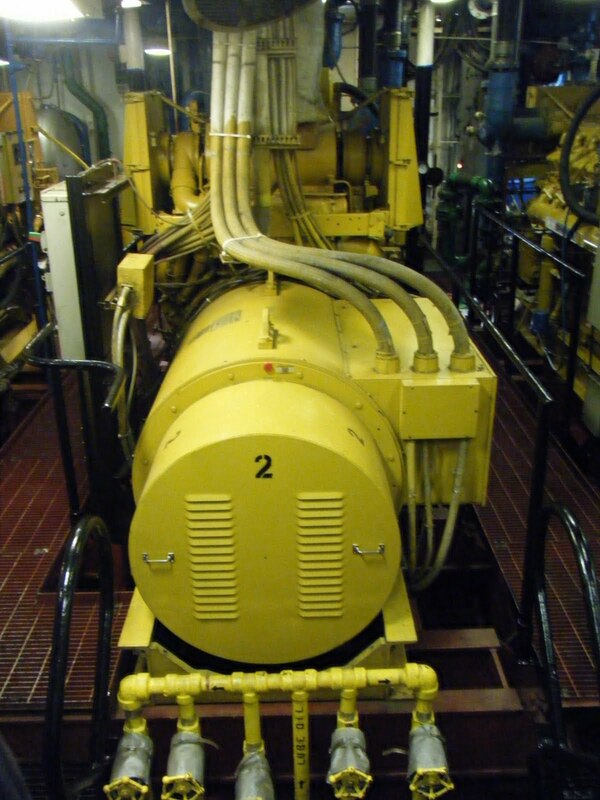 Right: One of 4 diesel engines that provided the electricity for the ship and run the electric motors that drive the propellers. Right: Glen, first assistant engineer and my tour guide. It would be easy to start every post with a beautiful sunrise or sunset photo. In this one, you can see Anatahan Island in the background. 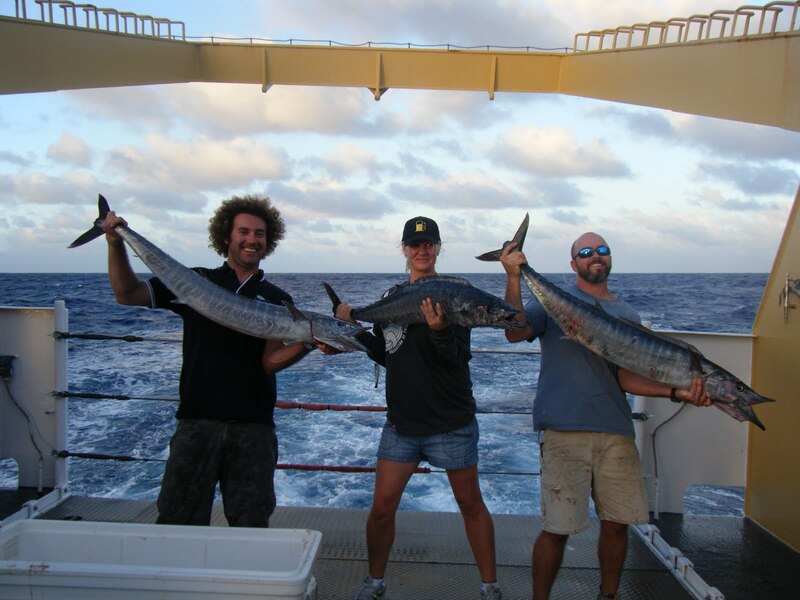 Just before the sunset, 3 large wahoo were caught. Poke and fried fish are the favorite items on recent menus (breakfast, lunch and dinner). Steve, Frances and Mills show off their catch. 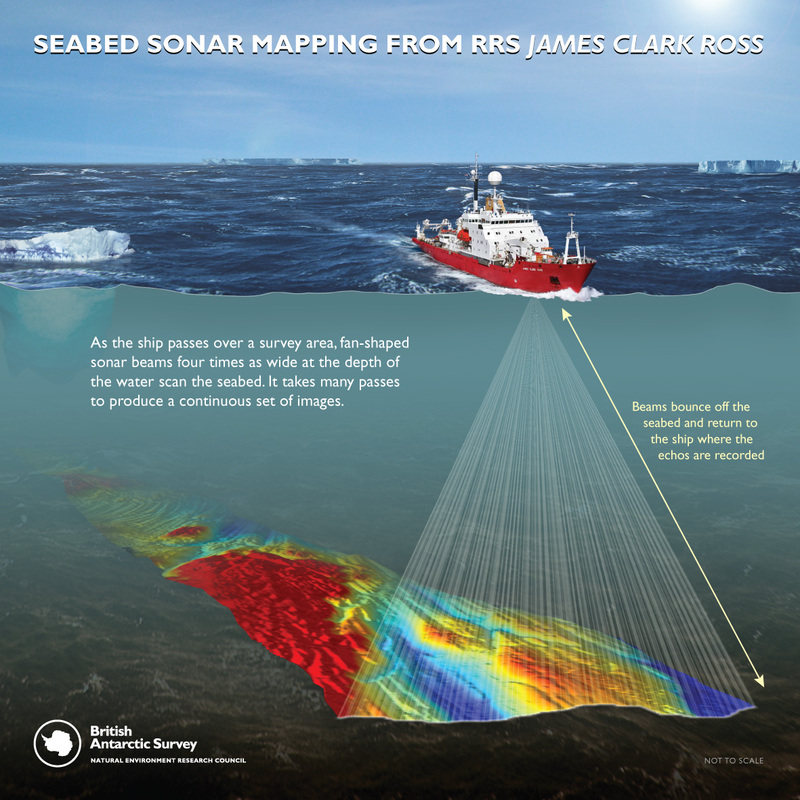 This photo/diagram shows how sonar waves ping the seafloor and also shows the bathymetric map that is made from the data. 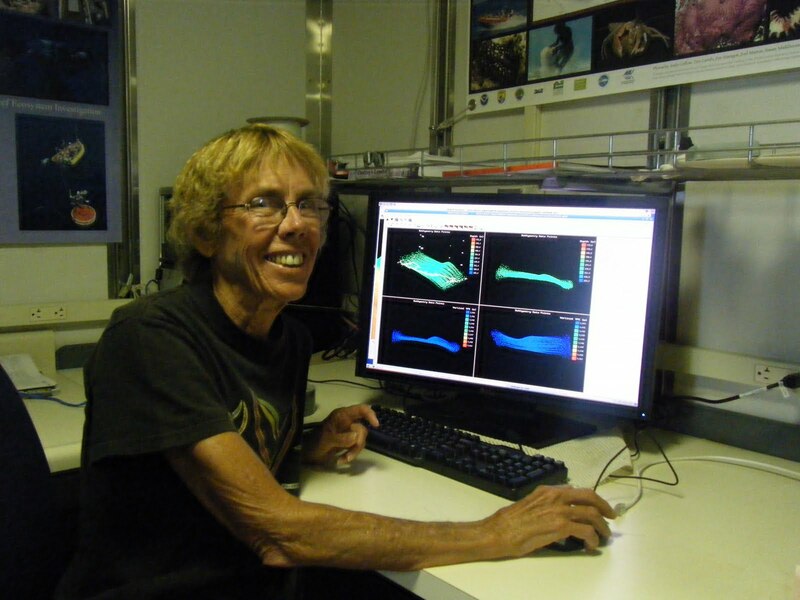 We used the multibeam sonar to map shallow banks north of Farallon de Mendinilla and east of Anatahan and Sarigan. The multibeam work continued day and night and produced huge amounts of data that needed to be processed. I can only sit at the computer for short periods, but the map team members work 10 hour shifts and most of that time is spent processing the data and making new maps. There are always 2 or 3 people processing the data. The TOAD seen with cameras facing forward. Monday night, we put out the TOAD (Towed Optical Assessment Device). 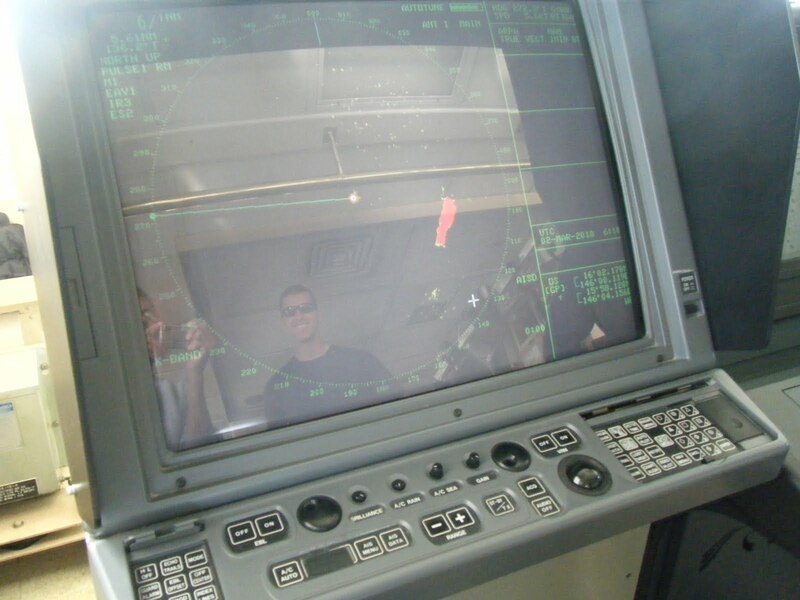 This camera is towed behind the ship and sends video directly to the control room. 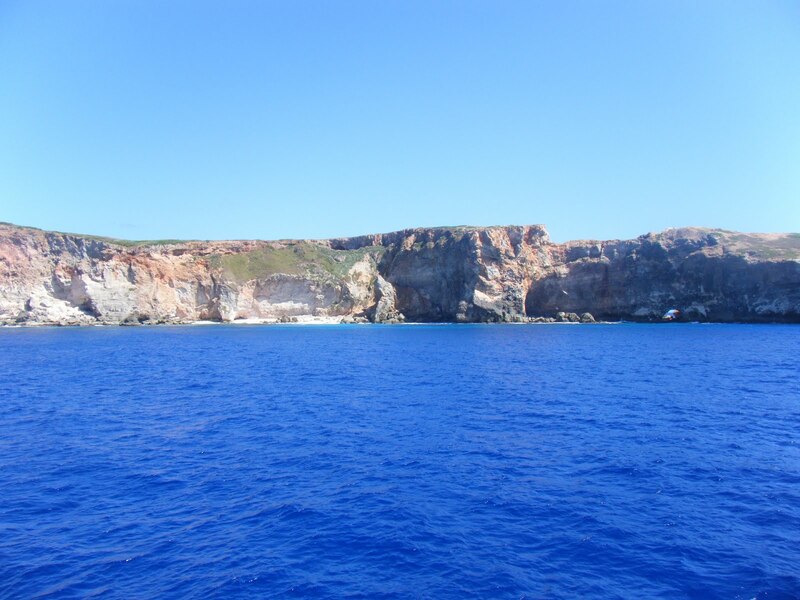 We were able to see some of the seafloor we had been mapping. The first run of the camera went for 2.25 hours, covered a distance of 3 miles and went to a maximum depth of 400 feet. The second run went for 3.5 hours, over 4.5 miles to a maximum depth of 300 feet. Towing the camera sounds easy, but someone must be on the controls to keep the camera from crashing into the bottom. The camera needs to be close to the bottom for the best video, but without someone on the controls, it can crash. Driving requires constant attention. Most of the seafloor had a sand coverage with some algae. Occasionally, there would be oohs and aahs over something other than sand and sea weed: sea stars, large sea cucumbers, sponges, sea urchins or the infrequent fish. I really enjoy watching real time video of previously unseen seafloor, but I found myself falling asleep on my feet. I finally had to give up and head to the bunk. Steve & Viv prepare the TOAD for launch. Today, we are near Saipan planning to do BRUV work during the day and the TOAD tonight. A nap might be a good plan so I can watch the TOAD through the night, but I don’t want to miss the BRUV action either. We continue to “kill dots” as we work our way around the island of Farallon de Mendinilla. The mapping here will be finished tonight and then we will head north to map the seafloor of a few seamounts and banks. Most of the recent questions on this blog have been about “killing dots,” as we edit the data from the multibeam sonar. I will tell you more about the map making process in a future post. 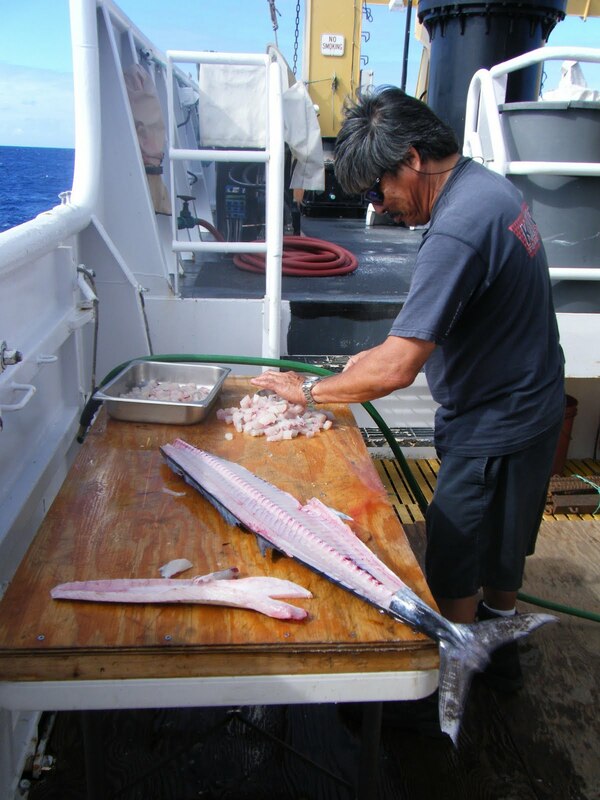 Today I want to show you some of the fun things we do aboard ship.Fishing is everyone’s favorite activity, either for the catching or the eating. The best method is trolling using lures when the ship is traveling at about 10 knots. This only happens when the ship is heading from one study area to another. 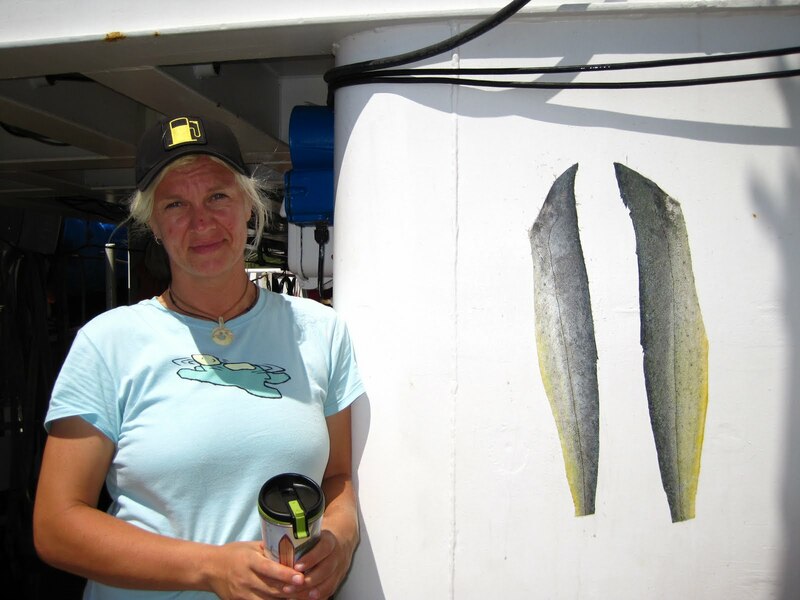 When using the multibeam, the ship travels at about 4.5 knots and the fish are less apt to bite a slowly moving lure. Kenji making poke from a wahoo he caught. Frances with mahi mahi skins she is drying to make a fishing lure. Before drying she had to remove all the meat and later all the scales were removed. The resulting skin is very tough. 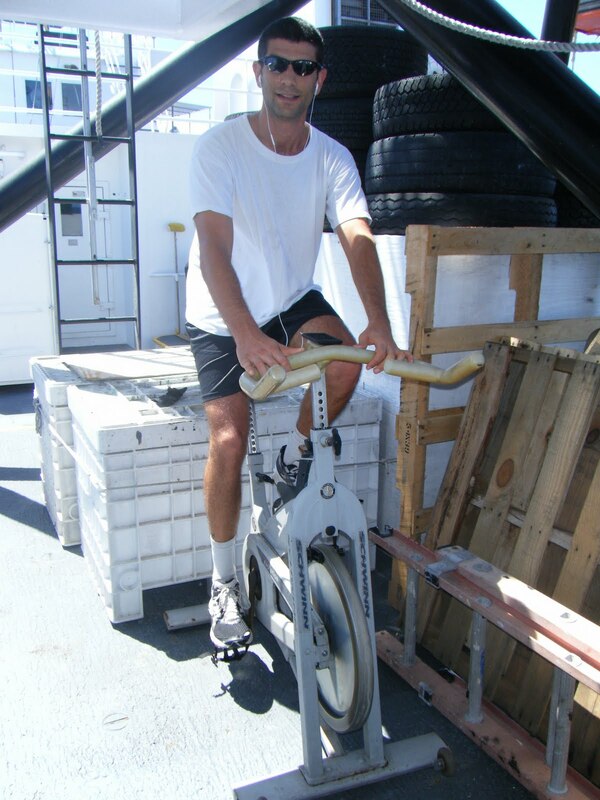 Jonathan on the exercise bike pedaling to Rota. There is an exercise room on the ship with a treadmill, rowing machine and weights. Many of the crew members like the bike best because it’s out on the deck with the great view. A few of the movies available. Movies are popular during breaks. 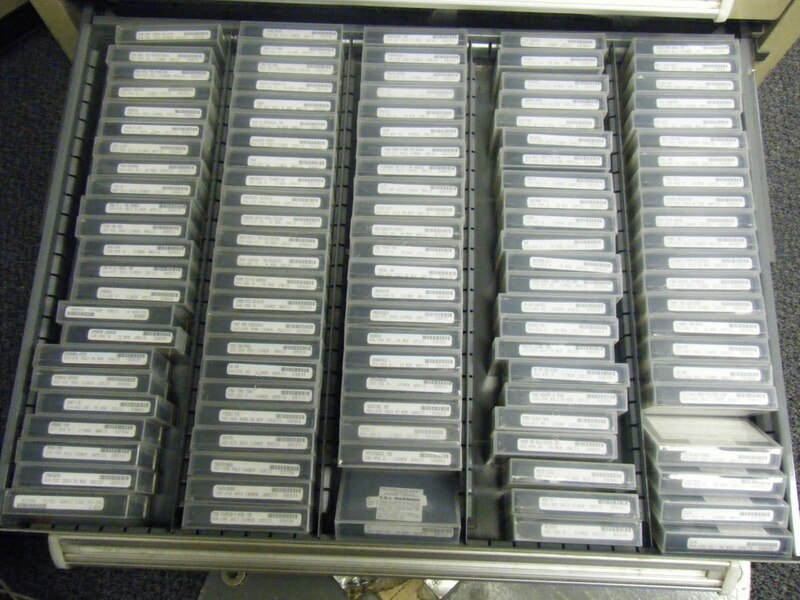 The ship has about 800 tapes including older movies and recent releases. Many of the crew members have personal collections as well. The desk in my stateroom. 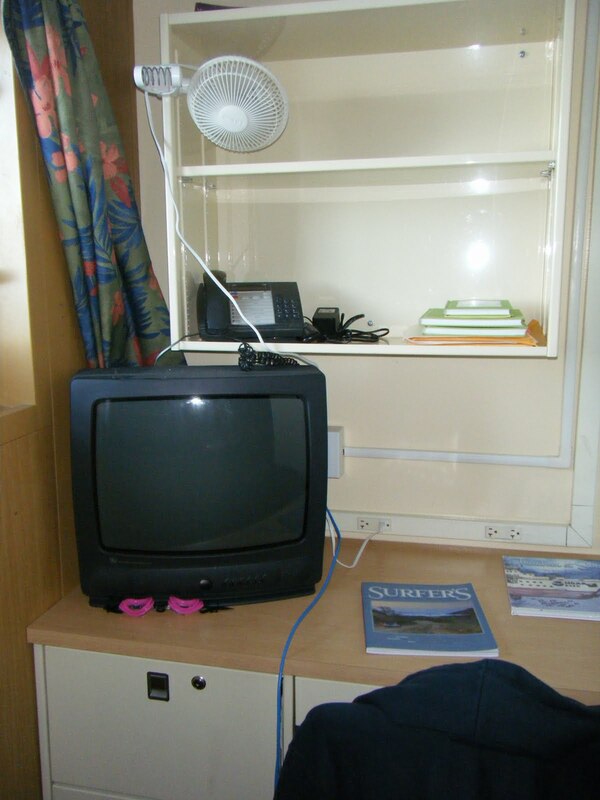 Each stateroom (bunkroom) has a monitor so the movies can be watched in the movie room, the lounge or the staterooms. The T.V. in the lounge also gets Fox News via satellite. The internet is a popular pastime. That also comes via satellite. The ship pays a set fee for the satellite service and there is no charge to us. There are three computers in the lounge available for everyone to use. There are internet connections on the bridge, in the science labs and in the bunk rooms for people with laptops. The library has a nice collection of books and board games so there is always something to do during non-working hours. Bellow: That’s me looking for whales. These binoculars are called “big eyes.” They are used on trips when scientists are studying mammal populations. 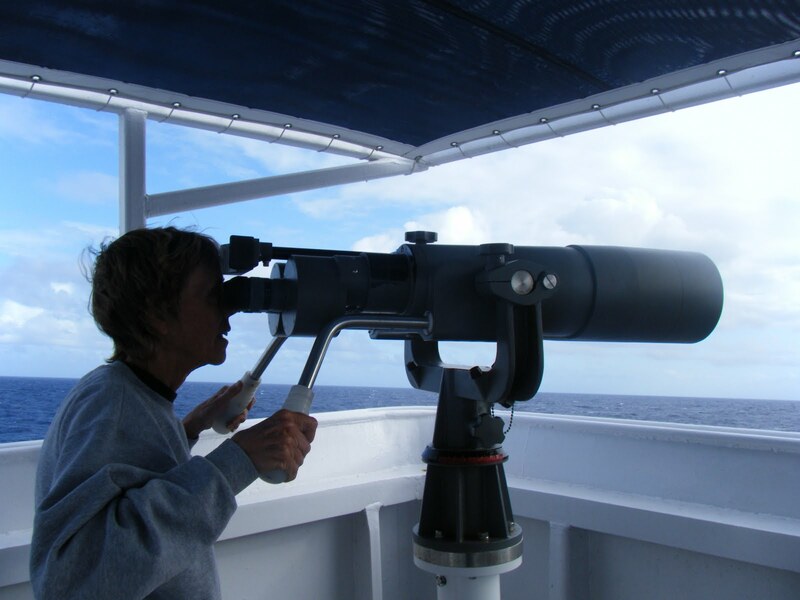 Using these binoculars from the highest point on the ship increases the likelihood of seasickness. 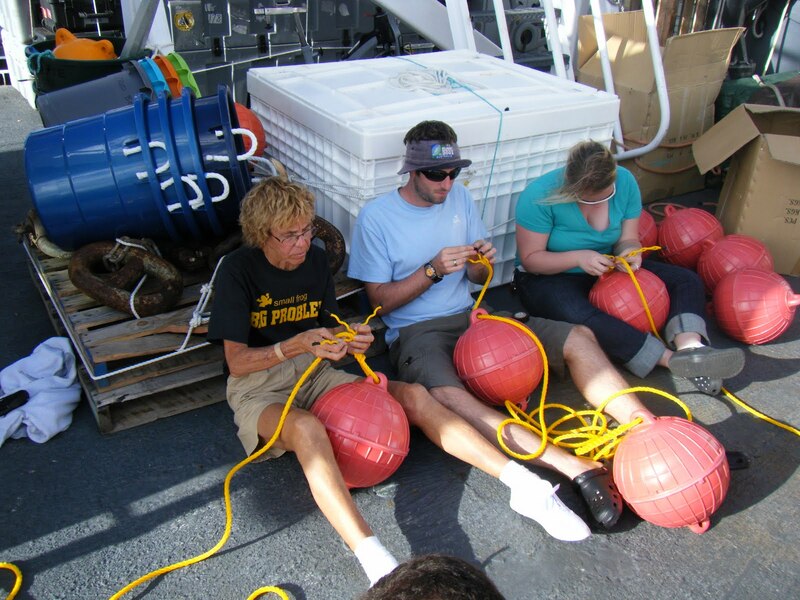 Here we are splicing lines to hold buoys. There have also been several knot-tying sessions. 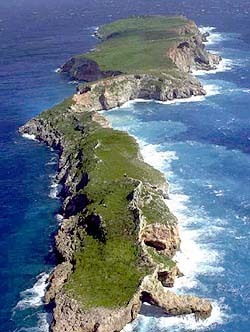 The BRIDGES of Farallon de Mendinilla and the Oscar Elton SetteWe lost half of the science team in Saipan. 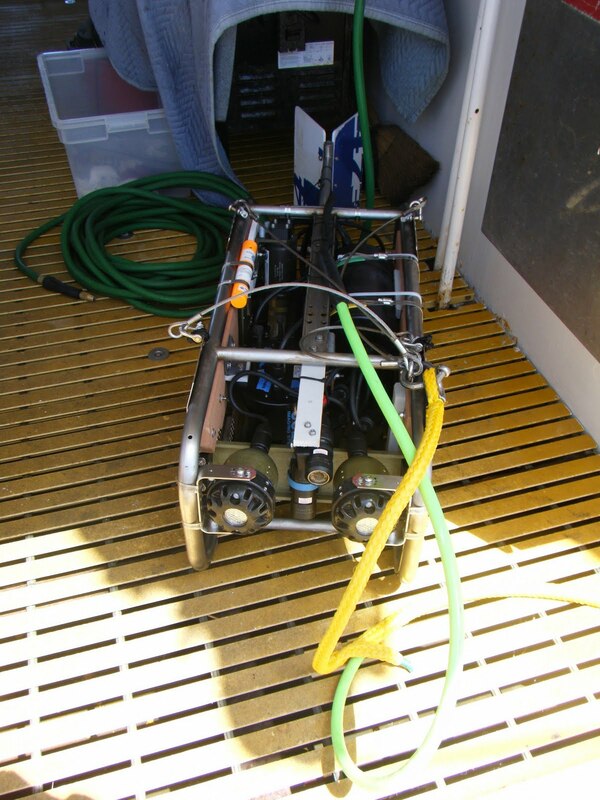 The fun work of surveying fish populations is over so the AUV, BotCam and BRUV teams have headed for home. A tsunami at sea is not felt by ships, but the tsunami warning came while we were still at the dock. We were alert and ready to depart, but fortunately for us and the entire Pacific, the tsunami didn’t materialize. 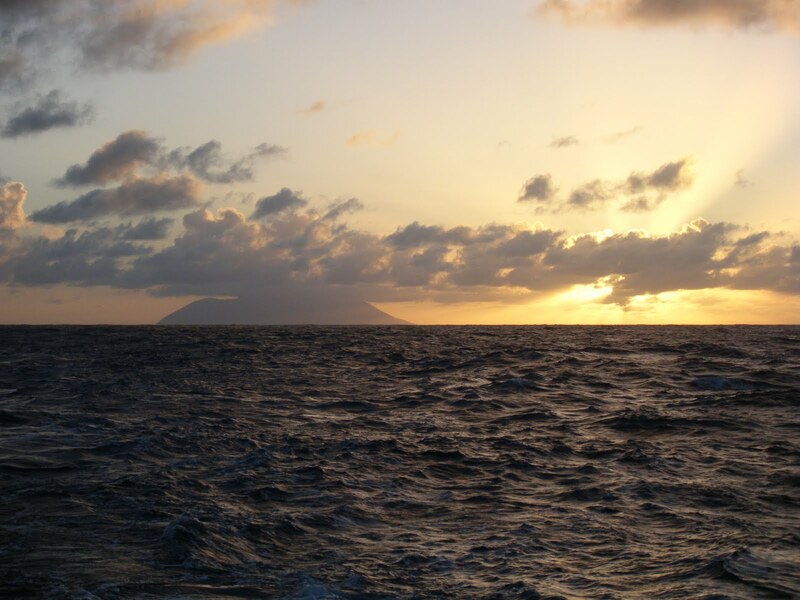 The island is small (1.6 miles long by 0.25 mile wide) with only grass and shrubs―not even one coconut palm. There are a lot of birds: frigates, boobies, terns, and other species. We’ve seen whales on three occasions. The ones that were close enough to identify were humpback whales. 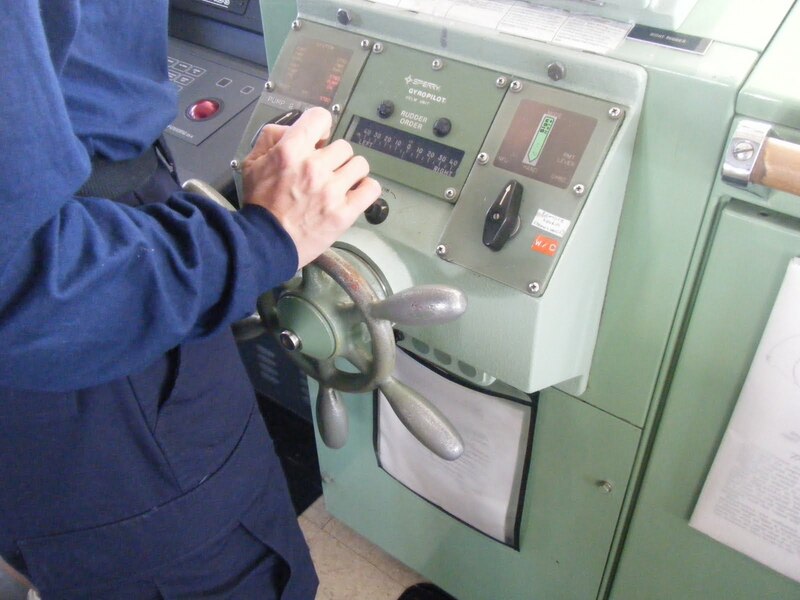 The BRIDGE of the Oscar Elton Sette is where the officers drive the ship, plot courses, handle navigational concerns and communications. I’ve had two tours of the bridge and am amazed by the electronics and complexity of each system. Rather than a description, I’ll just give you a few pictures. 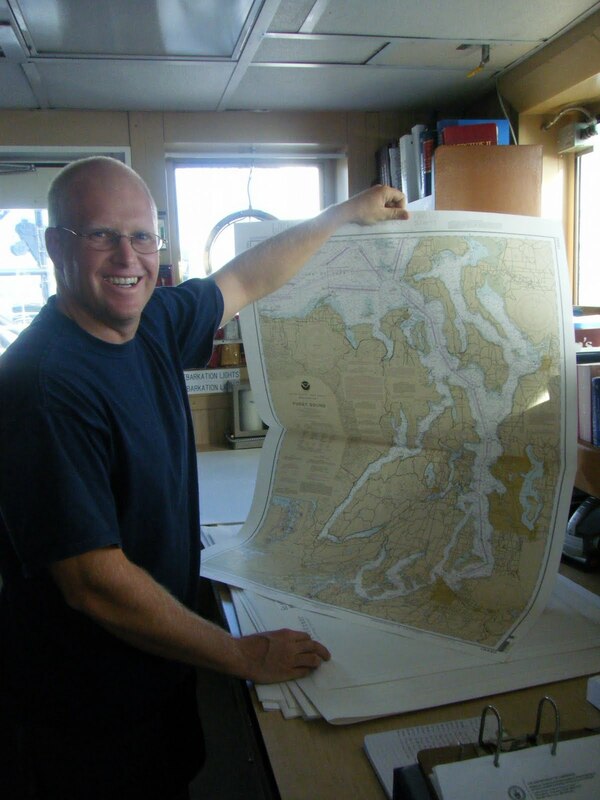 Eric showing one of the ship’s many charts. The steering wheel is considerable smaller than I expected. 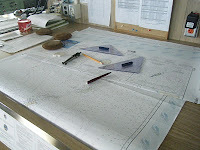 Chart table used for plotting the course. GPS is also used, but charts are kept in case the power fails. The iridium phone works via satellite. 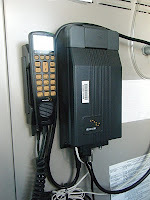 The crew can use it for personal calls during non-business hours (East Coast to Hawaii). That doesn’t leave much time but it is also available on weekends. Mike is reflected in the radar. 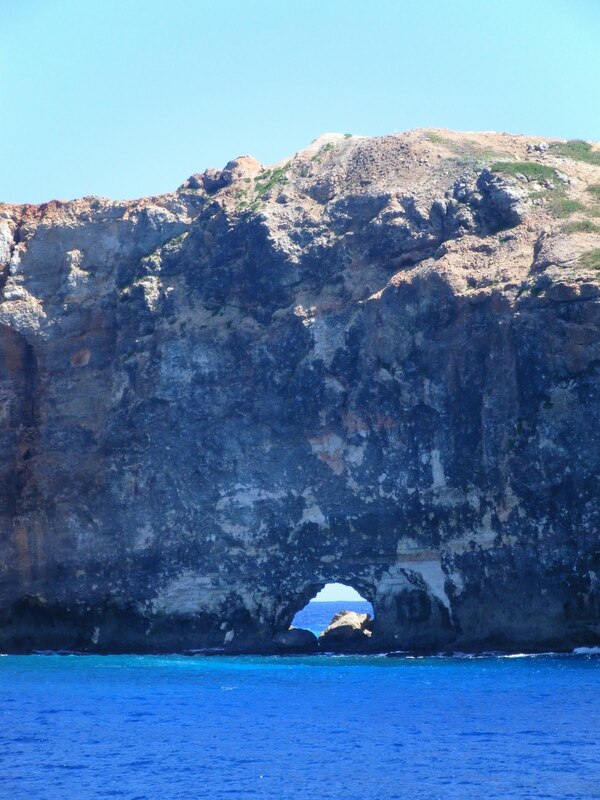 The red triangle just right of center is Farallon de Mendinilla. 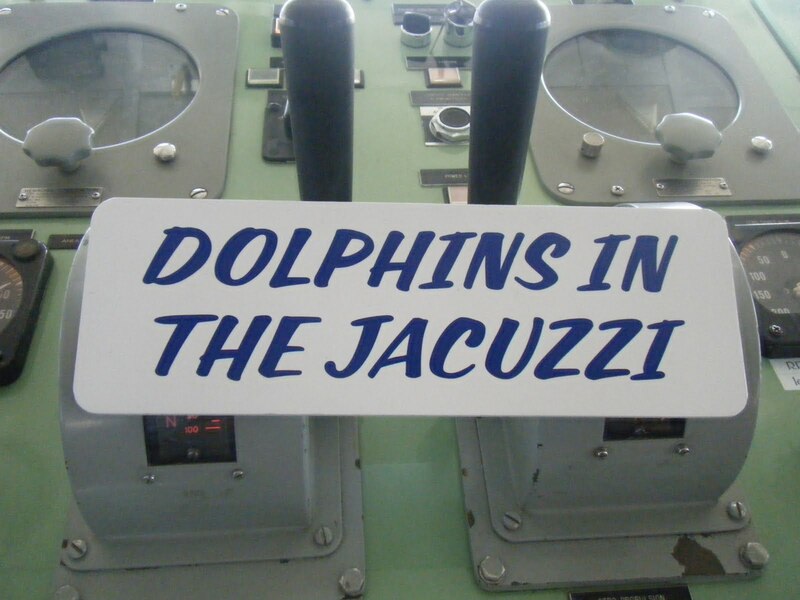 This sign on the bridge lets the skipper know that there are fishing lines off the stern.